Our 4th – 8th grade students will be participating in an exciting event on Wednesday, October 10, when we join 11,000 Catholic school children from 79 grade schools, many priests, Bishop Cozzens, and Archbishop Hebda for Mass at the US Bank Stadium! This huge and glorious event is sponsored by CSCOE (Catholic Schools Center of Excellence). 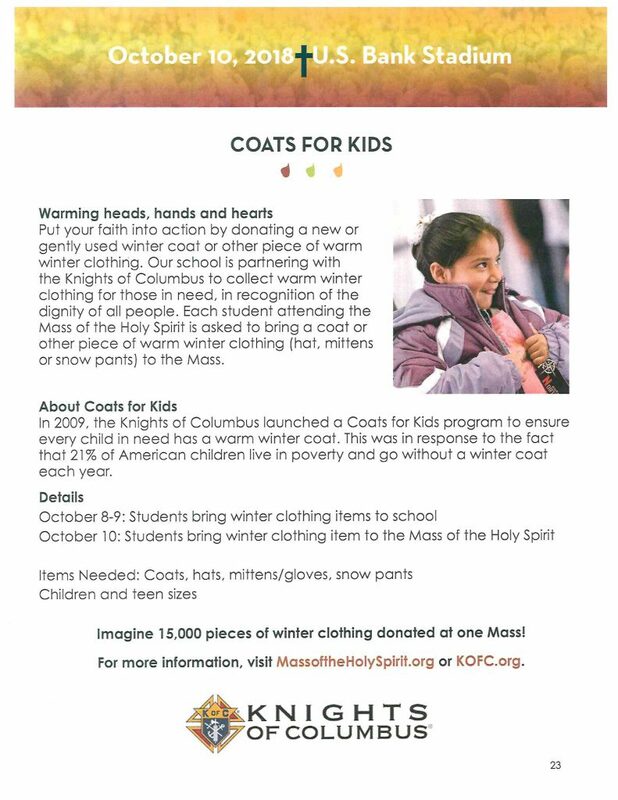 With this year’s Mass of the Holy Spirit we are partnering with the Knights of Columbus to collect warm winter clothing. Please click here for the handout titled Coats for Kids. It would be great if we could have an item for each of our 4th-8th graders to bring to the Mass! Items can be sent to school at any time, we will bring them on the bus to the Mass. Permission slips are coming home and we are in need of a limited number of parents who are E3 qualified to chaperone! If you are interested, please contact your child’s teacher.